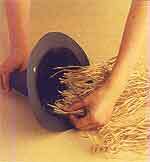 Making this witch hat is simple, yet so professional, that all witches are sure to be eyeing it. Not only does it goes very well with witch face paint, and with witch mask, but also with children and adults halloween parties, fancy dresses etc. So rake up your halloween, with these cool crafts and costumes from TheHolidaySpot! You will need this page again and again if you choose to make it. So remember to hit Ctrl+D to bookmark. Black card (posterboard), pair of compasses, scissors, craft knife and cutting mat, stapler, sticky tape, raffia, silver wrapping paper, paper adhesive. On the sheet of black posterboard card, draw a circle large enough for the brim of the hat . Cut the circle using scissors . Draw a Second circle inside the first large enough to fit the wearer's head. Cut around this line using a craft knife. 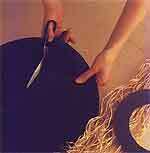 Measure the diameter of the brim and cut another circle of black card measuring about 15cm/6 in larger for the crown. Cut a slit from the edge into the center . Fold this circle into a cone shape to fit inside the brim. Staple the cone in position where the card overlaps. Tape raffia inside the cone at the back of the hat to form the witch's hair . Draw a star shape on silver wrapping paper. Cut out the paper star, and using paper adhesive, stick the star on the front of the cone. And presto! 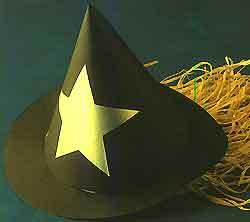 your witch hat is ready to flaunt at your halloween party!